Brian Bromberg created this year's hat-trick. After his high-acclaimed Compared To That, a mainstream jazz album, which also respects the desire for smooth jazz elements, he surprised his fans with Bromberg Plays Hendrix, a tribute to the late guitar legend. His third strike is In The Spirit of Jobim, a homage to the Brazilian songwriter, composer and musician Antônio Carlos Brasileiro de Almeida Jobim. Bromberg has carefully selected his co-players Airto (percussion, vocals), Alex Acuna (drums, percussion), Otmar Ruiz (piano), Corey Allen (piano melodies and fills), Ramon Stagnaro (guitar), Gary Meek (flute, sax), Mitch Forman (piano), Oscar Castro-Neves (guitar), Joel Taylor (drums), Mike Shapiro (drums, percussion) and the string section of The Rising Sun Orchestra. Bromberg introduces into One Note Samba on acoustic bass giving the marching direction of the percussion group. A purely acoustic treat. The popular Jobim song Wave, originally released in 1967, is well refurbished with great elegance. Coastline Drive is a piece for masters at work, a divine fusion of virtuosity and championship. Each connects with the music different associations and impressions. Little Tune awakes memories of a stay in Salvador de Bahia. A sense of lightheartedness. Tristefinado showcase anew Bromberg's vitality on acoustic bass concurring with one of the above mentioned guitarists. Corcovado, meaning "hunchback" in Portuguese, is a mountain in central Rio de Janeiro, Brazil. Atop this mountain is enthroned the statue of Cristo Redentor, the landmark Rio's. Airto's wonderful presentation is followed by Bromberg's bass like a bumblebee, while the guitar perfectly fits the orchestral strings. The uplifting Cha Chika Chika Boom crackling sparks as the Brazilian Carnival. Isn't It Beautiful? comes with a large orchestral use. Great musicianship and arrangement. Latin American guitar and orchestra blend into a superb sound structure on Ray Of Sunshine. Gary Meek's flute can share just delicate accents. Talia is a musical realization of the swaying walk, women makes so attractive. The contemporary jazz piece Ellen is dedicated to the jazz executive Ellen Cohn. Of course, on an album that is dedicated to Jobim, Girls of Ipanema cannot be missed. Bromberg's bass performance is embedded in a traditional concert, which is pleasantly standing of by some solos. 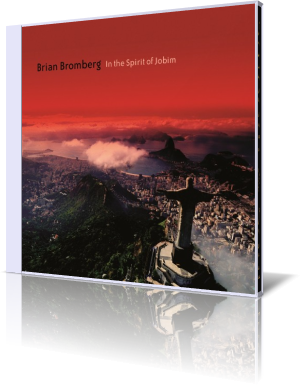 In The Spirit of Jobim showcases Bromberg's abundant affinity for Brazilian music, which is only exceeded by his love of jazz.